It is very spacious, especially having car seats. The main issue I have with my car is the leather seats, they do get very hot in the summer. With the maxima it has amazing trunk space, I can fit a double stroller and two boxes of diapers and still have room for my other groceries. The performance of it is wonderful, very good on fuel. The one thing I did wish it had is a better audio options like Bluetooth, but it can hold up to 5 CD's if that is something you would rather have. It does have heated front seats which is nice in the winter when you need the extra warmth. We had got it with larger exhaust tips, so it does have more of a rumble which is great when traveling with children. So far the car has not failed me so it is very reliable. Nissan Maximas are the way to go! 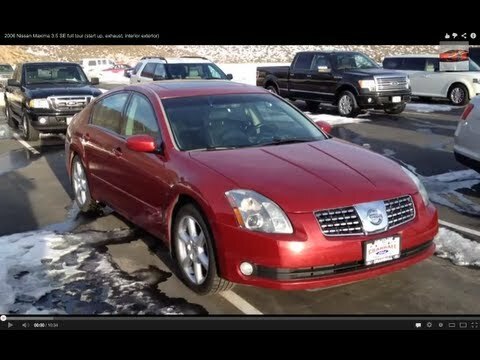 My 2006 Nissan Maxima is wonderful. I have had minor issues with it since I inherited it two years ago. I inherited it when it only have 30k miles and I have driven 50k miles in the two years that I have had it. I have one issue currently with the rotors. I usually have one big issue per year. Last year, the ac was not working. If I set it for 60 degrees Fahrenheit, it would still feel like 90 degrees. The car is very comfortable. I love how much you can control your seat settings and rear-view mirror settings. Those are the only bells-and-whistles I have since this is a 2006. Seat warmers, warms up quick. Has moonroof. Overall a good, reliable car. I have been having issues with starting the car. Not sure if it is battery or starter related. I have had it jumped a couple of times and it starts right up but if I leave radio, a/c, heat, etc.. On when I turn it off it has a hard time starting. I got one with leather seats which I do not like at all. It is a larger car than I am used to so I do not care for that. Overall it has been a decent car as far as make/model are concerned. I think it is just owner preference that has made me not like this car as much as others that I have previously owned.